Prayagraj is all set to host one of the most awaited religious and spiritual events of Hindus — the Kumbh Mela. Elaborate arrangements are in place for the Prayagraj Kumbh Mela 2019, which is officially starting on January 15 and is expecting more than 12 crore pilgrims over around 55 days of the mega celebration. The Kumbh Mela at Allahabad, which is now known as Prayagraj, is held in the month of Magh, as per Hindu calendar, when Jupiter is in Aries, and Sun and Moon are in Capricorn — or Jupiter is in Taurus, and Sun in Capricorn. This year, devotees have already started arriving for the Kumbh Mela to take a holy dip in the Triveni Sangam — the confluence of rivers Ganga, Yamuna and the mythical Saraswati — considered the centre of the earth according to scriptures. Known to attract the largest gathering of people anywhere in the world, the mela area is spread over thousands of hectares around the sangam. Kumbh Mela pilgrimage is undertaken four times over a 12-year cycle, based on a specific set of astrological positions of the Sun, the Moon, and the Jupiter. Other than Prayag, three place in India hosts the celebration in rotation — Hardwar, Ujjain and Nashik-Trimbakeshwar. All three places are situated next to a holy river — Ganga in Hardwar, Shipra in Ujjain and Godavari in Nashik. However, the Kumbh Mela at Prayag is different as compared to the others. The tradition of long-term Kalpvas — a one-month period starting from Ekadashi of the full moon in the Paush month up to Maghi Ekadashi the next month — is practised only in Prayag. It is believed Lord Brahma performed a yajna (havan) to create the universe, and that yajna was performed here. In 2017, Kumbh Mela was placed in the UNESCO Lists of Intangible Cultural Heritage, underlining its contribution to cultural diversity and creativity. According to the Uttar Pradesh government, more than 12 crore pilgrims are expected to visit Prayagraj Kumbh Mela 2019. While 20 lakh pilgrims are expected daily, 3 crore footfall is likely on Mauni Amavasya (4 February) alone. A total of around 10 lakh foreign tourists are expected too. 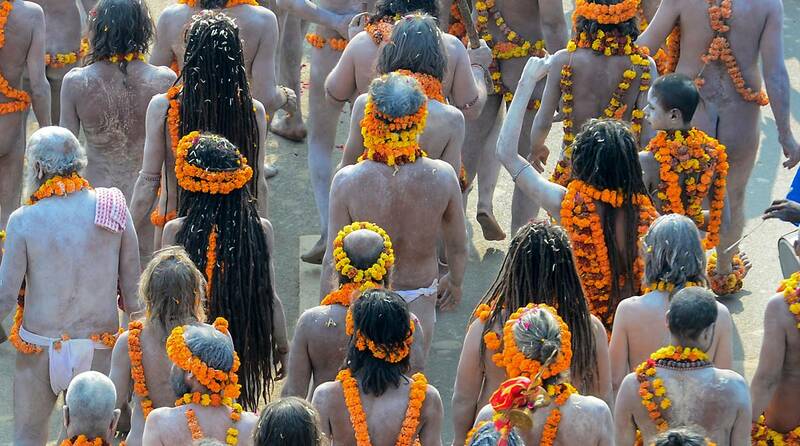 The Kumbh Mela at Prayag takes place for approximately 55 days. And the celebration has been continuing since ancient times. It is believed that taking a holy dip in the holy rivers is a path to salvation as it relieves people of the cycle of rebirth. Millions of pilgrims, riding on their beliefs, perform various traditional rituals at Triveni Sangam during the Mela. Matsya Purana says Rishi Markandeya had told Yudhishthir that this place was specifically protected by all the gods, and that a kalpvas here truthfully observing the 21 rules through mind, speech, and action fulfils all the desires of a person. Eighth-century philosopher Shankara had detailed the origin of Kumbh Mela, tracing its foundation in the ancient legends. The Puranas talks about Gods and demons fighting over the sacred kumbh (pitcher) of amrit (nectar of immortality) obtained after churning of the sea (Samudra Manthan). It is believed that gods eventually managed to take control of the Kumbh and took it to the heaven. On the way, as per legends, a few drops of the nectar fell on four places on the earth — Haridwar, Ujjain, Nashik and Prayag. It apparently took 12 ‘divine days’, equivalent to 12 years for the humans, to carry the nectar to the heaven, which explains the practice of organising the Kumbh Mela after every 12 years. There is historic evidence that Kumbh Mela got widespread recognition during the rule of King Harshvardhana (590-647 CE). Hsuan Tsang has mentioned the grandeur of the celebration in his travelogue. After Independence, successive governments started organising the Kumbh Mela, putting in place facilities for the pilgrims coming in large numbers. Kumbh Mela has a huge astrological significance because all the four places take turn to host the mega event as per positions of the planets. According to astrologers, the Prayagraj Kumbh happens when Jupiter enters the Aries constellation and the Sun and the Moon are in Capricorn constellation. Apart from holy dips and Kalpvas, aarti and deepdaan form other important aspects of the Kumbh Mela. 15 January (Makar Sankranti): The Sun makes entry into its next astronomical position on this day, as per the Hindu calendar. Pilgrims customarily donate as per their will from this day at Kumbh Mela. 21 January (Paush Purnima): Kumbh Mela unofficially begins on this day. The full moon tithi also marks the beginning of Kalpvas. 4 February (Mauni Amavasya): Astrologers believe the planetary positions are most favorable for bathing in the holy waters of Sangam on this date. The maximum number of pilgrims can be seen on this day. 10 February (Basant Panchami): This day is dedicated to the arrival of Goddess of Knowledge Saraswati on Earth, as per Hindu mythology. Devotees can be seen wearing yellow on this day. 19 February (Maghi Purnima): This day too sees a high number of pilgrims, who believe a bath in the Sangam on this day will guide them to heaven in human form. According to mythology, Hindu God Gandharva travelled from the heavens to Sangam on this day. 4 March (Mahashivratri): This great night of Lord Shiva coincides with the Kumbh Mela day when Kalpvasis take their last holy bath in the Sangam. Tourist Walks: The Uttar Pradesh government has introduced two Tourist Walks — Sangam Walk and Prayagraj Heritage Walk — for those visiting Prayagraj. Laser show: The Laser Light and Sound Show has been operational since December on the Prayagraj Fort Wall. Waterways: The Inland Waterways Authority of India is organising ferry services on the Yamuna near Sangam Ghat. The route followed is Sujawan Ghat to Rail Bridge (Naini Side) to Boat Club Ghat to Saraswati Ghat, ending at Kila Ghat. Cultural events: There will be 5 cultural pandals for events on a daily basis from January. Peshwai (Praveshai): Peshwai, or “Praveshai”, is the grand procession that is carried out to mark the beginning of the Kumbh Mela. The procession has saints arriving in Kumbh along with their groups on elephants, horses and lavish carriages with bands. Special routes are demarcated for these processions.